I’m not psychic, I can’t see into the future but I am certain that 2017 will have more than its fair share of scams. I’m certain of it because that’s the pattern. Scams aren’t going away. In fact they’re multiplying. Despite the lessons we should have learned over the last few years, people continue to fall for the nonsense peddled by the proponents of various Get Rich Quick schemes. You might think that with the memory of Eurextrade fresh in our minds, people would now understand that any scheme they encounter that promises to quickly make them rich is a lie, wouldn’t you? But it’s not so. Even within days of Eurextrade collapsing the same people who had been busy recruiting other victims had moved to an identical but short-lived scheme calling itself Oil of Asia and were doing their best to recruit other to that scheme instead. Not only hadn’t they learned their lesson but they thought they could recover some of the money they’d lost by joining another scam. These were serial scam victims. And it’s still happening. In 2016 we’ve have a series of pyramid and Ponzi schemes. As with all scams, most of them failed to gain any momentum and quickly faded away. We were lucky enough to have seen some of them in time and warn people but a few gained some traction and managed to sucker in some victims. The year began with MMM Global, a classic Ponzi scheme formed by a convicted Russian scammer called Sergei Mavrodi. In fact, Mavrodi spent time in a Russian prison for running Ponzi schemes so you’d think that would make people think twice before handing over their cash to a man like him. Not so. Thousands of South Africans, Zimbabweans, a few of us and many, many Nigerians signed up and handed over their money hoping to earn the 100% return the scheme promised every month. However, like all such schemes it collapsed firstly in South Africa and is now, as you read this, collapsing in Nigeria, leaving many people much poorer than when they joined. Our good luck was that our market was too small for MMM Global to thrive and unlike Eurextrade, this scam wasn’t targeted specifically at Botswana. Then came called Amazing5 that offered 5% per day for a month, a deal that, if it was true, would have more than quadrupled your money. That one didn’t last very long at all. Then came Pipcoin, the first example we saw of a new type of scam. These are the pretend Bitcoin scams. Bitcoin is a genuine digital currency that has the potential to change the future of money but these scams are just pale imitations of Bitcoin. In the case of Pipcoin there was no actual currency, digital or not, it was nothing more than a Ponzi scheme. They claimed that a mere 35% profit per month but that wasn’t enough to persuade enough victims to hand over their money. Pipcoin was very closely followed by its twin, Billcoin. 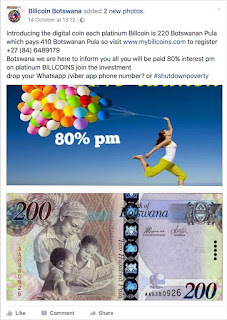 This scam made a much more ambitious promise of 80% profit each month but this was also no more than a Ponzi scheme in which any “profits” people received were just taken from the initial contributions made by people joining after them. 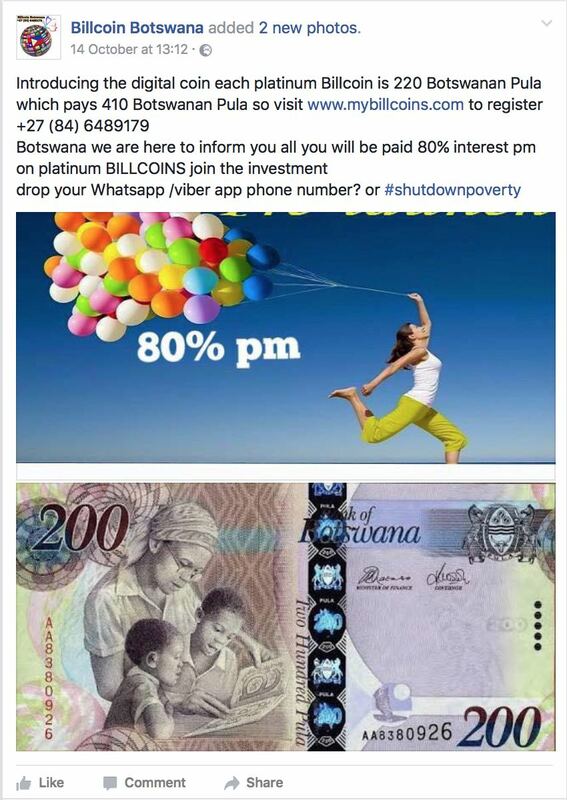 Billcoin still exists and there’s even a Facebook group devoted to promoting it in Botswana but I suspect it’s already about to fail very soon. Helping Hands International came next. This was a pyramid scheme in which recruits were encouraged to recruit multiple levels of people beneath them and it was made very clear that there was “no buying of stock” and “no selling”, just the recruitment of other people. That’s the dictionary definition of a pyramid scheme. But Helping Hands International was different. Their lies were extraordinary. For instance they claimed that their scheme was “supported” by companies such as Hyundai, Apple, HP and Lenovo but this was just a pack of lies. Companies like those don’t “support” pyramid schemes. Then we went back to the pretend Bitcoin scams. It’s important to say again that there’s nothing inherently wrong or illegitimate about Bitcoin. It’s a real currency but it’s a really risky thing right now. It’s a real currency but it’s entirely unregulated and there are no rules to protect you if you buy and spend using Bitcoins. There’s absolutely nobody to complain to if things go wrong. Also, like any other currency, it’s value can go down as well as up and Bitcoin has crashed before. But this time it wasn’t Bitcoin we met, it was a scheme surrounding the buying and selling of Bitcoins calling itself the Bitclub Network. Some clues about the real nature of this scheme can be found on their web site. They describe their scheme as “The most innovative and lucrative way to earn Bitcoin” and they say they have “a referral program so you can get paid for anyone you refer”. It’s a pyramid scheme, nothing more than that. My prediction is that there will be more and more schemes like this in 2017, particularly the ones surrounding Bitcoin. They’ll exploit our ignorance and they’ll continue to target us as a country. That’s because we have a reputation for being gullible. Eurextrade showed that. That was a scam specifically targeted at us. It didn’t try to recruit people in Namibia or South Africa, it was only recruits in Botswana they wanted and our reputation hasn’t changed over the subsequent years. My hope is that in 2017 there’ll be a miraculous surge in skepticism in Botswana and that scammers will learn that we’re no longer the gullible nation of potential victims they currently perceive. But I suspect I’ll be disappointed.